This section explains how to remotely manage your guests using ssh or TLS and SSL. More information on SSH can be found in the Red Hat Enterprise Linux Deployment Guide. The ssh package provides an encrypted network protocol which can securely send management functions to remote virtualization servers. The method described uses the libvirt management connection securely tunneled over an SSH connection to manage the remote machines. All the authentication is done using SSH public key cryptography and passwords or passphrases gathered by your local SSH agent. In addition the VNC console for each guest is tunneled over SSH. ssh does not scale well with larger numbers of remote machines. Red Hat Virtualization enables remote management of large numbers of virtual machines. Refer to the Red Hat Virtualization documentation for further details. The following instructions assume you are starting from scratch and do not already have SSH keys set up. If you have SSH keys set up and copied to the other systems you can skip this procedure. SSH keys are user dependent and may only be used by their owners. A key's owner is the one who generated it. Keys may not be shared. virt-manager must be run by the user who owns the keys to connect to the remote host. That means, if the remote systems are managed by a non-root user virt-manager must be run in unprivileged mode. If the remote systems are managed by the local root user then the SSH keys must be owned and created by root. You cannot manage the local host as an unprivileged user with virt-manager. Change user, if required. This example uses the local root user for remotely managing the other hosts and the local host. Generate a public key pair on the machine virt-manager is used. This example uses the default key location, in the ~/.ssh/ directory. Remote login without a password, or with a passphrase, requires an SSH key to be distributed to the systems being managed. Use the ssh-copy-id command to copy the key to root user at the system address provided (in the example, root@host2.example.com). Now try logging into the machine, with the ssh root@host2.example.com command and check in the .ssh/authorized_keys file to make sure unexpected keys have not been added. Repeat for other systems, as required. The instructions below describe how to add a passphrase to an existing ssh-agent. It will fail to run if the ssh-agent is not running. To avoid errors or conflicts make sure that your SSH parameters are set correctly. Refer to the Red Hat Enterprise Linux Deployment Guide for more information. Add the passphrase for the SSH key to the ssh-agent, if required. On the local host, use the following command to add the passphrase (if there was one) to enable password-less login. The SSH key is added to the remote system. The libvirt daemon provides an interface for managing virtual machines. You must have the libvirtd daemon installed and running on every remote host that needs managing. After libvirtd and SSH are configured you should be able to remotely access and manage your virtual machines. You should also be able to access your guests with VNC at this point. Remote hosts can be managed with the virt-manager GUI tool. SSH keys must belong to the user executing virt-manager for password-less login to work. Open the File->Add Connection menu. 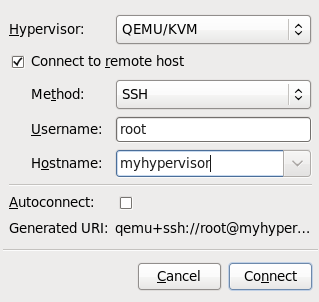 Use the drop down menu to select hypervisor type, and click the Connect to remote host check box to open the Connection Method (in this case Remote tunnel over SSH), and enter the desired User name and Hostname, then click Connect.